My beloved sister-in-law got married over the weekend. They were married two years ago in a civil ceremony in England, where they live, but renewed their vows near the bride's hometown in BC, Canada this past weekend. My wonderful brother-in-law's family and friends came over to Canada for the festivities and people came from all over western Canada (some even came back from holidays in Asia for the event!). The wedding was held at Pillar Lake Fishing Resort near Falkland, BC. It's very picturesque with a long, narrow lake along one side and little log cabins beside the lake. My SIL is a talented artist (and ridiculously well-organized planner) and her hubby is a graphic artist, so you just imagine how nicely everything was decorated! She found the dress online but made the beaded sash and headpiece herself - crafty lady! The groom displaying the finished product. And creepy eyes. 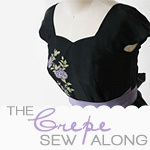 I made my dress out of a deep plum double-knit fabric which had lots of stretch to it. I wasn't sure how big I would be, and I wanted it to be comfy. I used Vogue V1194 (DKNY) but made several alterations to the pattern. I omitted the sleeves (after all, it's a summer dress! ), and added a deep v-cut to the back of the dress. I also used Nette's tutorial to make a bow for the back, and sewed four decorative buttons down the back. I got tons of compliments on it, and felt very comfortable all day. Although I think it might make me look a bit more pregnant than I am.... hello denial much?!?!?! I was 14 weeks as of this past weekend. The bump is growing! Hope you all had a wonderful weekend, wherever you may be. It looks beautiful! (And that purple is exactly the colour my sister-in-law was looking for for bridesmaids' dresses and couldn't find! Of course, I wasn't really sewing at that point...) I really like the V-back detail and the buttons. Yes it was soooo yummy! It was actually an ice cream cake that my cousin-in-law made (from scratch)! She is amazing!